Most of the birds listed to the left are review list species in Illinois. Review list species are birds that are sufficiently rare they require documentation. Note: To see a list of the birds recorded in Illinois, refer to The Birds of Illinois series on The Orniphile website. Montrose Point in Chicago is a mecca for birders. At least 345 species of birds* have been recorded there over the years, including a staggering variety of rarities and vagrants. Among these are Magnificent Frigatebird, Reddish Egret, Barrow’s Goldeneye, Mottled Duck, Black Rail, Wandering Tattler, Slaty-backed, Ross’s, Black-tailed, and Ivory Gulls, Royal and Sandwich Terns, Burrowing Owl, Groove-billed Ani, Ash-throated Flycatcher, Rock Wren, Sage Thrasher, Grace’s, Kirtland’s, and Townsend’s Warblers, Golden-crowned Sparrow, Painted Bunting, and Eurasian Tree Sparrow. Besides the unusual species, Montrose is an excellent place to observe migration, particularly the spring and fall passerine movement. What makes it so good? A combination of factors, including habitat diversity, location along a natural corridor for migrants, and the fact that Montrose Point protrudes well into Lake Michigan. Additionally, the easy access and small size make it attractive to birders. *Recent additions: Long-billed Curlew (April 13, 2019), Barred Owl (March 23, 2019), Long-tailed Jaeger (September 9, 2018), Black-bellied Whistling-Duck (August 17, 2016), Neotropic Cormorant (May 27, 2016). For more information about Montrose, take a look at the Montrose Frequently Asked Questions page. To see a list of the birds that have been recorded at Montrose, refer to the Birds Recorded at Montrose Point in Chicago page. To read about some of my recent Montrose bird sightings, please see my Twitter page. The Montrose Glossary contains terms used in this guide. 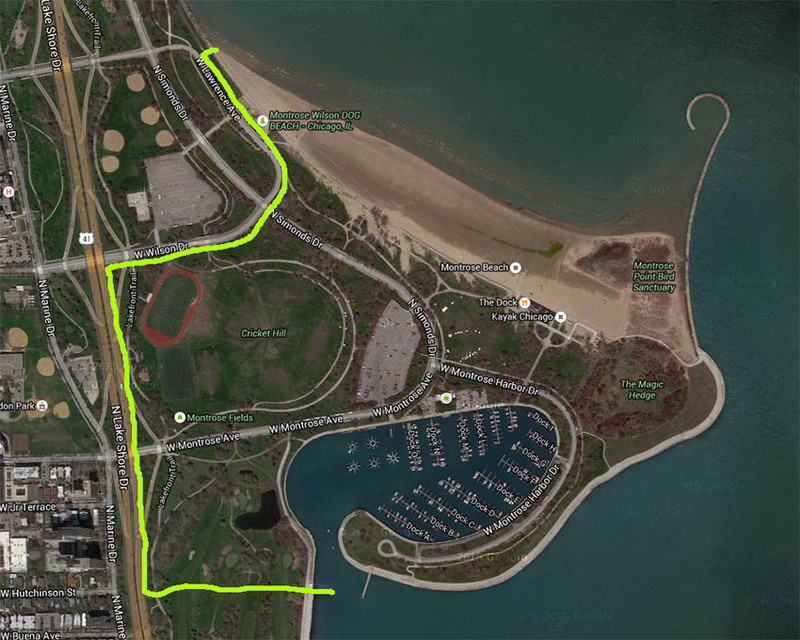 This Google Map of Montrose Point shows the road system around Montrose Point. This Google Map of Montrose Point shows the locations of several Montrose birding hotspots. Brief descriptions of each area are also given. Check out the Montrose Point Hotspot on eBird for the latest sightings. Montrose Point is located within Lincoln Park on the north side of Chicago. The area covered by this guide is bounded by North Lake Shore Drive and West Lawrence Avenue between North Simonds Drive on the west, the mouth of Montrose Harbor on the south, and West Wilson Drive on the north. This includes Montrose Beach, Montrose Harbor, the small pond at the north end of Waveland Golf Course, and Cricket Hill. 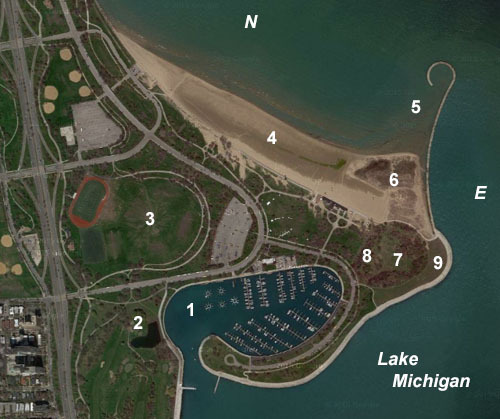 On a map, Montrose Point looks like a curled arm bulging out into Lake Michigan. The link below opens an image that shows the boundaries of Montrose Point as defined in this guide. To reach the main birding areas at Montrose Point, take West Montrose Avenue (4400 North) east until you reach West Montrose Harbor Drive. Turn right (east) at West Montrose Harbor Drive and proceed about 1/5 of a mile. You can park along either side of the road. The best birding areas, including the Magic Hedge and Montrose Dunes, are to the east and northeast. In terms of habitat, Montrose Point is open parkland, with scattered trees, copses, shrubs, hedgerows, and grassy fields. Montrose Beach Dunes is a foredune habitat that developed in recent years due to the low level of Lake Michigan. The Dunes consist of a diverse community of beach-loving plants, some of which are quite uncommon. In April of 2001, a major planting project began at Montrose Point. To protect the new trees and shrubs, a large part of Montrose Point, including the famous Magic Hedge, was fenced off. The fence was removed a few years later. Also in 2001, the entire eastern portion of Montrose Beach, including the nascent dunes, was fenced off as a protected nature area. Since then, the area is being restored to its natural state and exhibits much of the flora and fauna that is historical to our region. In 2008 the southeast corner of the Point was fenced off to protect the vegetation and discourage cruising. Access to this area is forbidden, and if you do enter you could be arrested. See the Montrose FAQ page for Montrose do’s and don’ts. A number of car break-ins occurred at Montrose during the summer of 2011. If you drive to Montrose always remember to roll up your windows, lock your doors, and take your valuables with you. In 2013 the eastern panne in Montrose Dunes was cordoned off to protect the vegetation from trampling and disturbance. The western panne was cordoned off in 2014 for the same reason. Birders are asked to stay out of these areas. : : Geoff Williamson and Leslie Borns made important contributions to this guide.